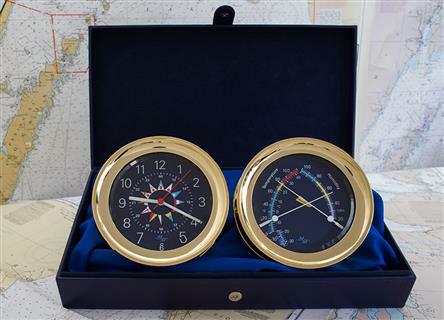 Includes a Quartz Clock and Comfort Meter in a Re-Usable Gift Box. "I wanted to say thanks for putting out such an excellent product. The design and quality are outstanding!" "I recently received the Master Mariner clock and comfort meter. I loved the look and design of both. Also, the quality of construction is great, while the price is unbeatable for comparable instruments." 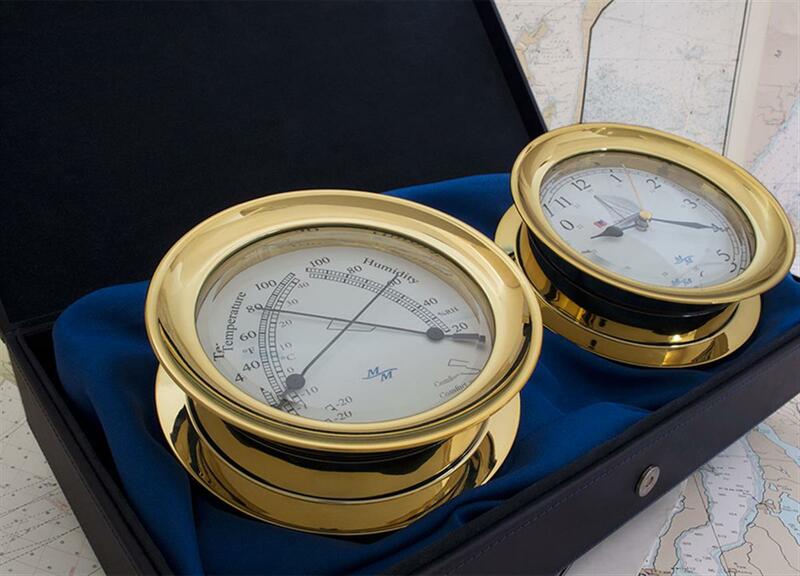 Master-Mariner has been designing and producing the finest instruments for over 40 years. We are pleased to present our top-quality, dual applied for US Patent, nautical instrument gift sets at an affordable price. 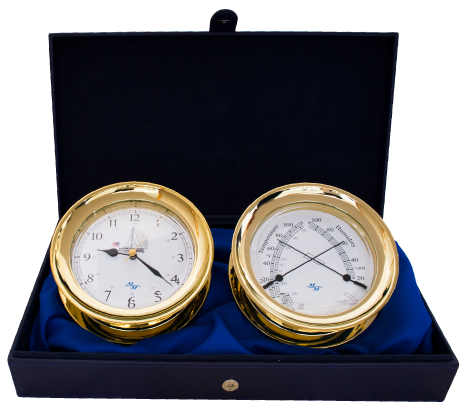 Our 2-instrument gift set, containing a Comfort Meter and Quartz Clock, is backed by a 30 Day No Question Warranty & a 1 Year Limited Warranty. If for any reason you’re unsatisfied, Master-Mariner will refund your money - no questions asked. 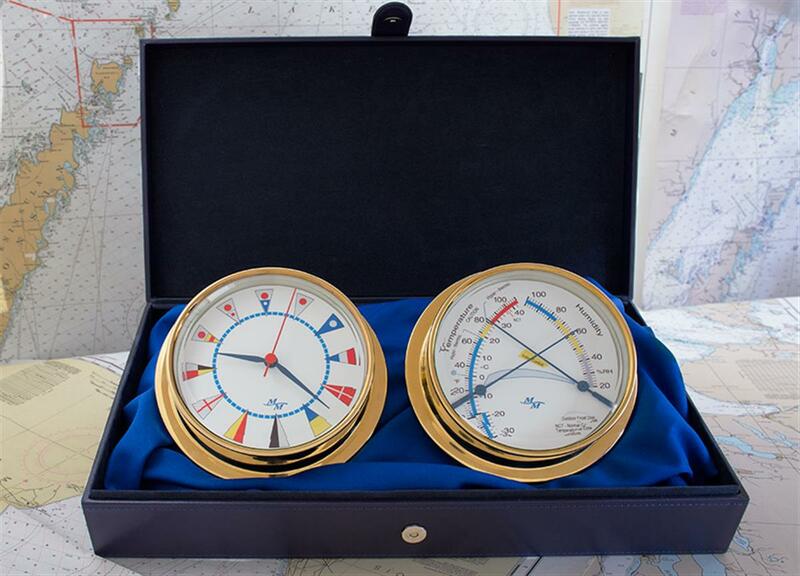 A great gift idea choice of six unique instrument sets for the sailor, power boater, fisherman or outdoor enthusiast. 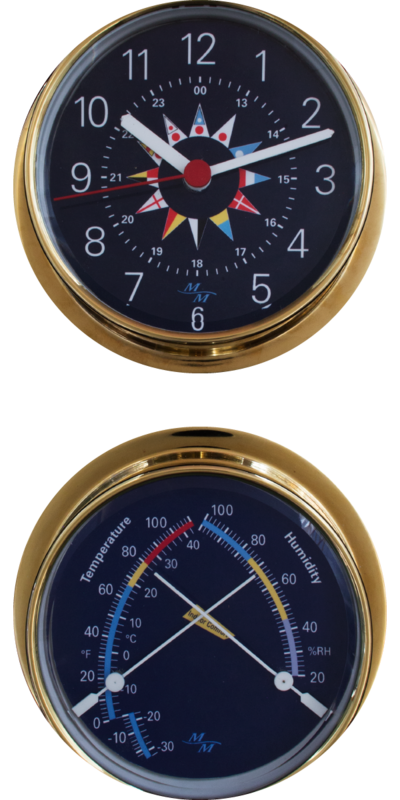 Suitable for indoor or sheltered outdoor use in boat, RV, garden, patio or office. Four different cradle styles and systems to choose from to match your budget, including plaques of your choice, ready for personalization. Includes a luxury leather finish gift box with felt lining and magnetic closure ideal for other uses. Designed in the UK with 2 US Patents Pending. 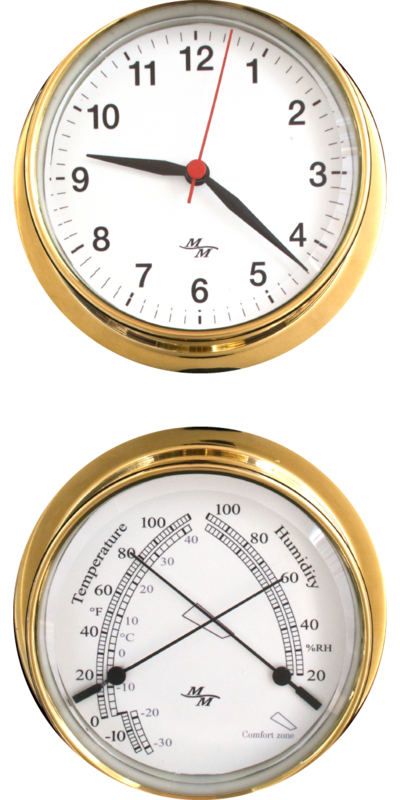 Comfort Meter uses German sensing coils to show temperature, humidity and their ideal combination for comfort. Cases of 430 Stainless Steel .70” thickness and CHI MEI ABS #PA-727. Physical Vapour Deposition (PVD) Nitride or Vacuum Metalized Lifetime Mirror Finish. 4-mm thick beveled glass lenses. Up to 22 ounces each x 5 3/4” diameter. Ready to install, with complete installation kit including mounting templates, alignment tool, drill bit and even an extra hanger bar with screws included. Patent-pending unique gravity-fixed mounting system eliminates the need for any visible flange screws. Includes reusable blister pack, microfiber cleaning cloth and storage box for safe seasonal transport; use it on the boat in the summer or in your office during winter. Customize Your Gift Sets! 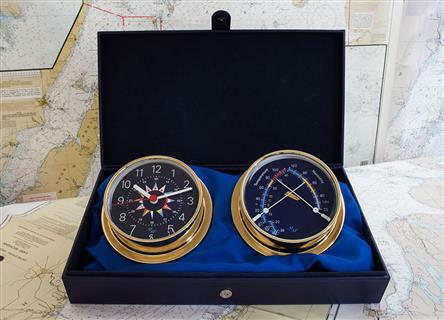 Select a Dial Face & Instrument Case. Our 30-Day No Question Warranty is simply that. For any reason you do not want to keep the instruments you purchased, simply fill out the RA form below and once an RA # is issued via email to you, follow the instructions for return. Easy! Our Limited 1 year warranty allows you to return instrument gift sets for repair or replacement. If you have a question about your product or if you wish to initiate a return you can email our staff at info@master-mariner.com. If we can't solve your problem we will send you an RA form. Once you have been issued the Return Authorization, we will advise how and where to ship the product back to us. Product MUST be returned to our warehouse for a proper refund. Product shipped to our offices will be returned. Can the instrument be used outdoors? 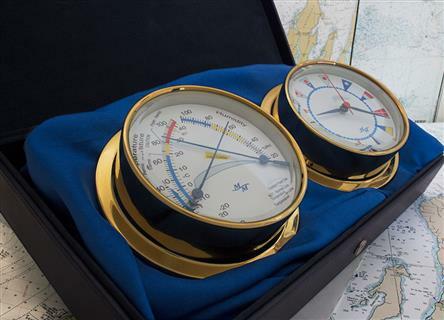 Master-Mariner does not warranty our product against direct weather exposure i.e. direct rain or snow or seawater. We suggest you mount your instruments in an area that is sheltered against the elements. On your patio, you may find a nice roof overhang to shield your new instruments from direct weather. 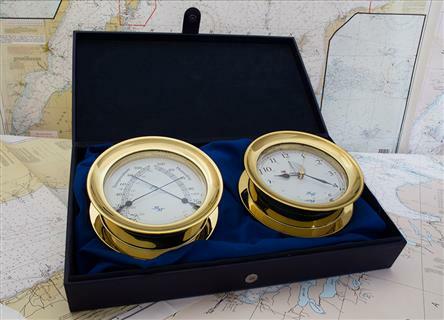 On your boat, below decks is preferred to outside, or if mounted on an outside deck area, under shelter. 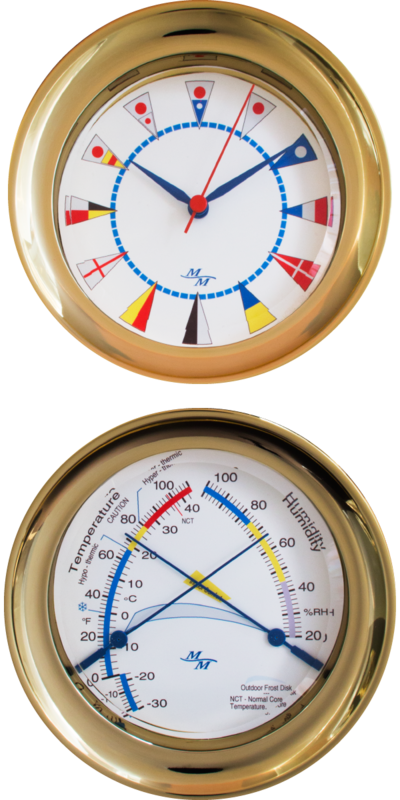 We also suggest, for greater accuracy, to mount the instruments out of direct sunlight or your Master-Mariner thermometer may read a higher temperature than the actual ambient temperature. How much do the instruments weigh? 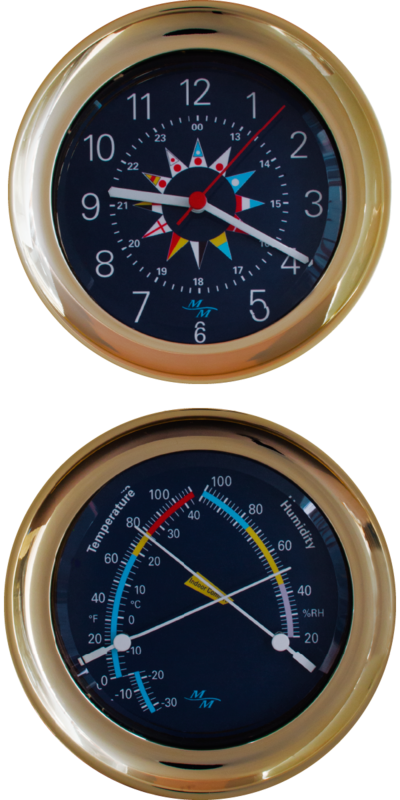 The Windlass Set instruments weigh approximately 22 ounces each and the Cabin Set instruments weigh 18 ounces each. What if we break our mounting T-bar? Master-Mariner provides an extra T-bar in every Gift box set, or three T-Bars for two instruments! We understand anyone can make a mistake. For this same reason we provide extra screws in your gift box. In the future, we will have T-Bars available for purchase on our website. 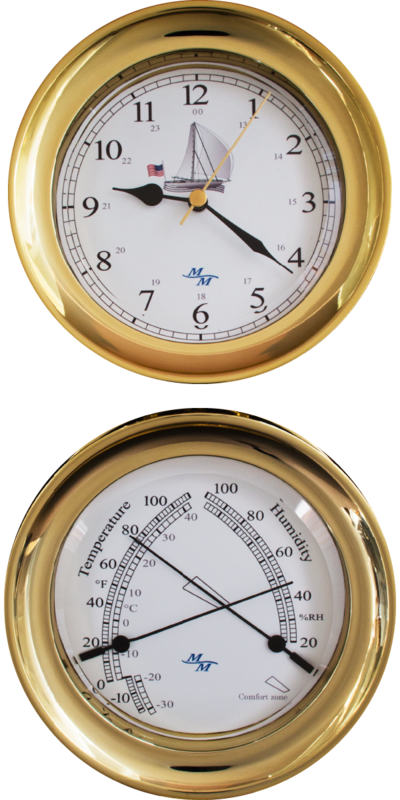 How do I know my hygrometer and thermometer are accurate? 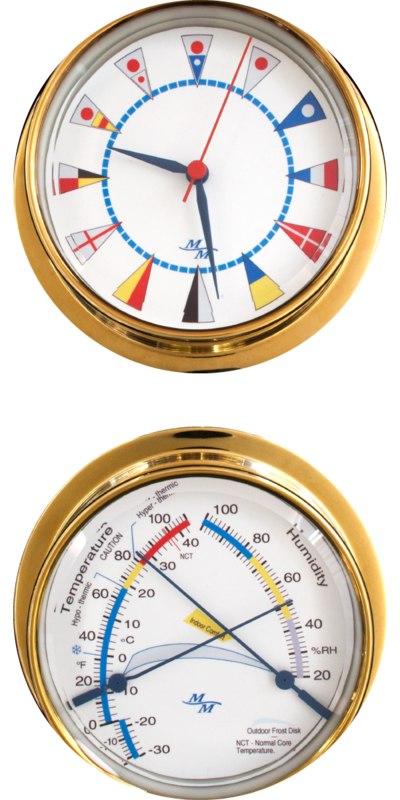 Master-Mariner uses the very highest quality coil spring hygrometer and thermometer movements in our products. Please refer to our product service page to test and calibrate your instruments. What if we want our Windlass or Cabin Sets to display on a desk or mantel? 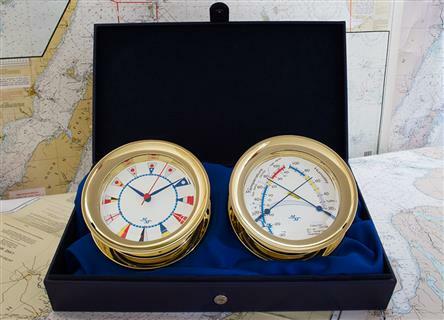 Master-Mariner offers single and double hardwood cradles for your Gift Sets. These are constructed American Walnut or American Pecan in 3 different finishes. 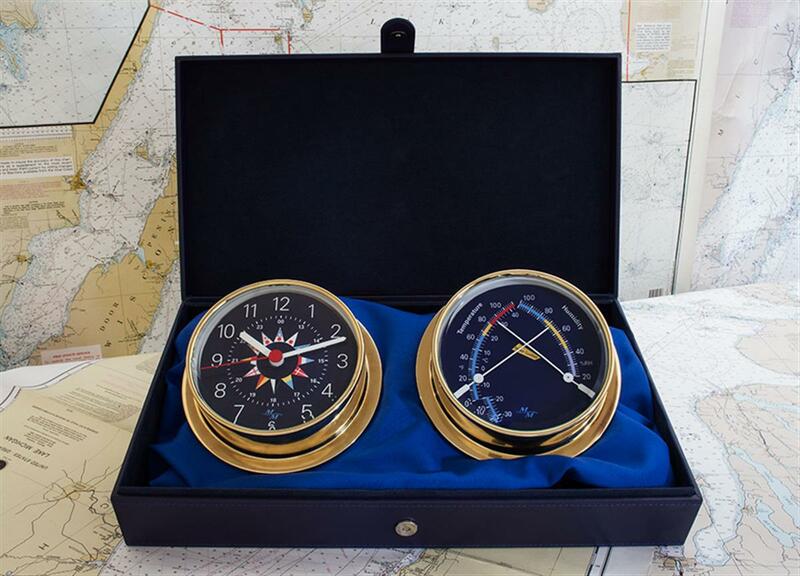 We also have hardwood wall plaques in attractive finishes to match your home or boat. Is the Gift Box real leather? No. Master-Mariner does not harm any animals to produce our product line. Our wood cradles are also not real mahogany to comply with the CITES agreement on endangered wood species. Do you have a question or need help with your order? Fill out our form below and our friendly staff will reply within two business days *Asterisk denotes required fields. Do you want to personalize the 2-instrument gift set with your company logo? Please fill out the form below and we will contact you with more details. *Asterisk denotes required fields.